I drove to Florida for Memorial Day last weekend and made a pit stop at Striplings General Store in Cordele, GA. Just off I-75 on the Florida-Georgia Parkway, road trips have included a stop here for as long as I can remember. If headed north, essential purchases include a slurpie and a bag of their homemade beef jerky. If headed south, where refrigeration is just hours away, needed provisions include a couple of pounds of smoked sausage and a hot/cold bag for the remaining trip. Every time I stop at Striplings I have meat on the mind. Imagine my surprise then when I stepped out on the hot pavement, shimmering with newly arrived summer heat, and thought of strawberries. The air was heavy with the fragrance of ripe fruit. When I pulled in to the parking lot, I hadn’t given the humble fruit stand, tucked off to the side,a second look. The wooden shack backed up to a dusty, planted field and the fact that it overlooked gas pumps, made me dismiss it out of hand. But then there was that smell. I like to compare strawberries to tomatoes: good ones are elusive. When lucky enough to taste a truly fine specimen of either species, the taste and experience sticks with you. It becomes an obsession. I buy countless numbers of both tomatoes and strawberries when they are in season in the hopes of obtaining epicurean transcendence. The majority are flat and insipid. That was not the case with my gas station strawberries. The smell was not deceiving. $4.00 from my wallet resulted in 2 pounds of strawberries and a car that smelled of the fruit. Before I even pulled out of the parking lot, I rinsed a strawberry and took a bite. A brilliant, deep red from skin to core, it almost made my teeth ache with the sweetness. These were strawberries as they were intended to be and over the weekend, we savored every one of them. We ate most of them straight from the carton, others tossed into fruit salads, and a few made a delicious dessert drizzled with balsamic vinegar. Regretting that I only bought two pounds, upon returning to Charlotte, I promptly purchased another pint from a local market in the hopes that I might get lucky twice. It was not to be. 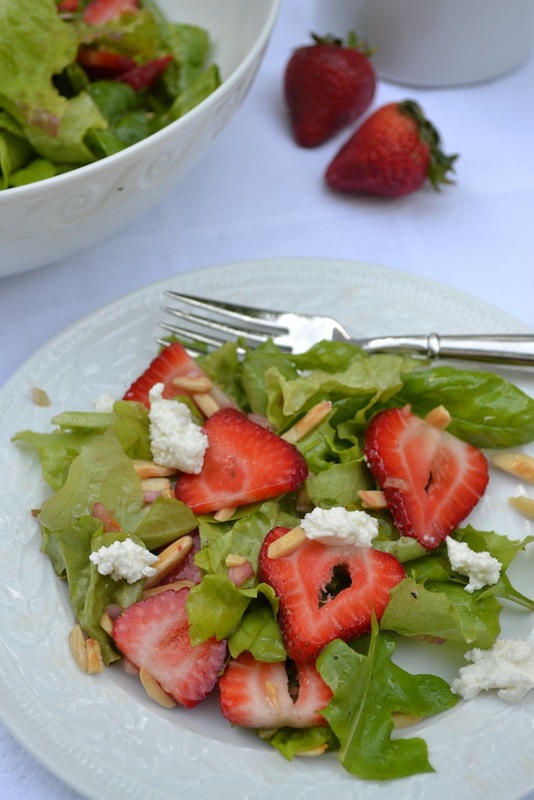 Still, by strawberry standards, they weren’t bad and to celebrate the short strawberry season, I prepared this simple, refreshing salad. Paired with fresh arugula, spinach, and lettuce from my garden, it’s a lovely and tasty addition to your late spring table. Happy cooking! 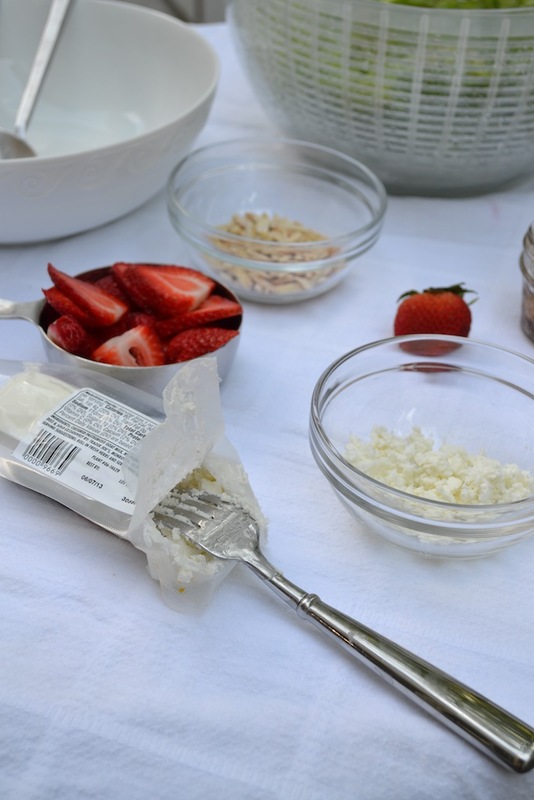 Crumbling goat cheese with your fingers can be messy. Use the tines of a fork to break off small pieces over salads. You’ll miss the finger licking, but not the mess. 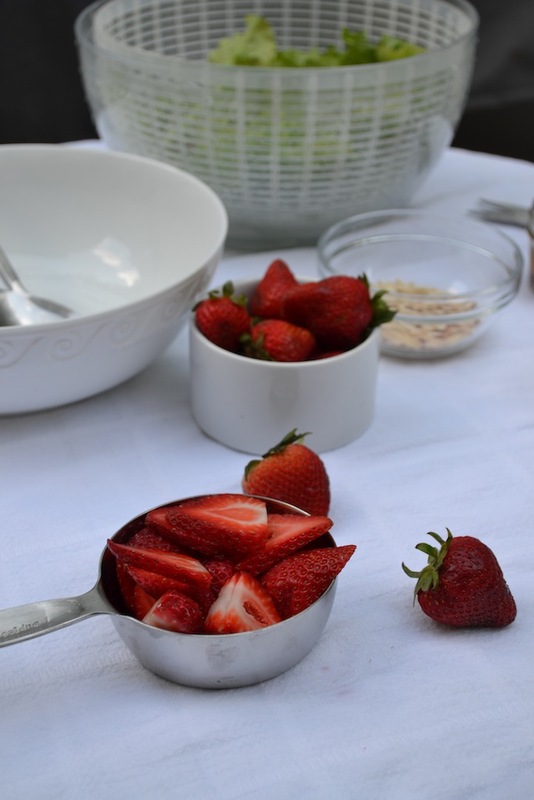 Toss the mixed greens, sliced strawberries, and almond slivers in a large bowl. Set the goat cheese aside. In a small mason jar, combine the shallot, olive oil, raspberry vinegar, salt, and pepper. Shake to combine. Taste and add more salt and pepper, if needed. Sometimes vinegars can be a little harsh and acidic. If this is the case, add a pinch of sugar and shake well. Taste and add more sugar, a little at a time, if needed. Add half of the dressing to the salad and toss to combine. Add more if needed. Divide the salad between chilled plates and sprinkle with the crumbled goat cheese. * To toast nuts, simply add them to a small skillet (no oil needed) and heat over medium heat. Don’t walk away! While not complicated, you need to watch the nuts carefully and shake often as they toast. Nuts go from a lovely golden brown to black quickly.